During the height of the Jessica Rabbit pins released in 2007 - DisneyStore.com (still known as DisneyShopping.com) began to get creative with some of their offerings. 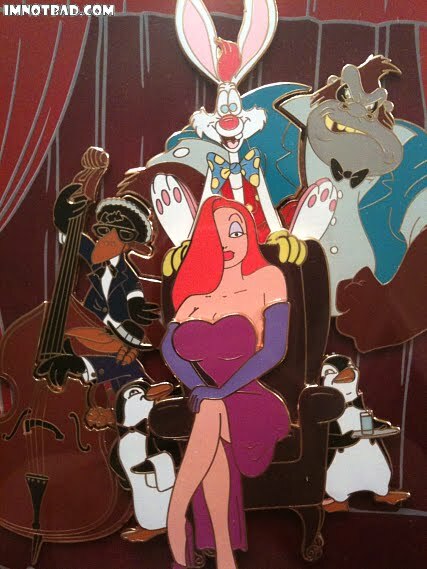 One of which was the Jessica & Roger Rabbit Super Jumbo Puzzle Pin. A staggering six inches tall and featuring a very interesting top layer - was it well worth its $40 price tag? Disney offered a preview of all the upcoming online pins on a brochure, complete with release dates and other specifics. The Jessica & Roger was one such pin, which noted this pin to be six inches tall and an LE 500. 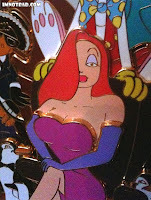 It soon became a highly anticipated release as it was the biggest Jessica Rabbit cast pins to ever be released to date. The pin was available in July of 2007 - however as an LE 1000 - not LE 500. This one change did leave the pin hanging around a lot longer online. I'm not sure if it ever ended up at a sale price, but it was originally $40. 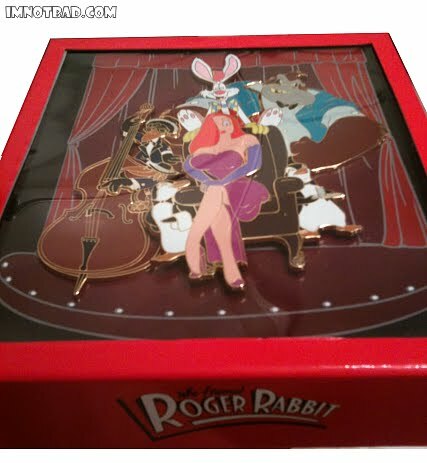 The whole pin came in a red window box with the Who Framed Roger Rabbit logo on the sides. While in photos it appeared the background curtains might be part of the pin, it was actually the cardboard backer the pin was attached to. The pin featured several layers and different puzzle pieces put together for one big pin. One very interesting choice for a separate layer was Jessica's bust! 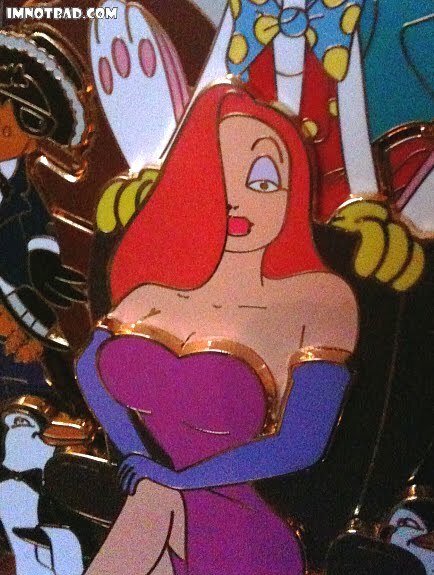 Her bosom actually gets its own layer on this pin - giving it that extra dimension it desperately needed. This was a first, but not the only, time Jessica's bust was added as a separate layer. The Disney Soda Fountain Christmas 2010 Santa Roger and Jessica used the bust layer and so far is only the second pin to do so. 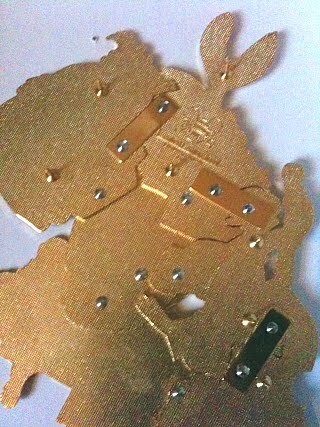 There were six separate layers to this pin which make it come together as a puzzle. Pin 1 is the bottom part of the cello. 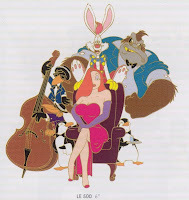 Pin 2 are the two crows and the top of the cello. 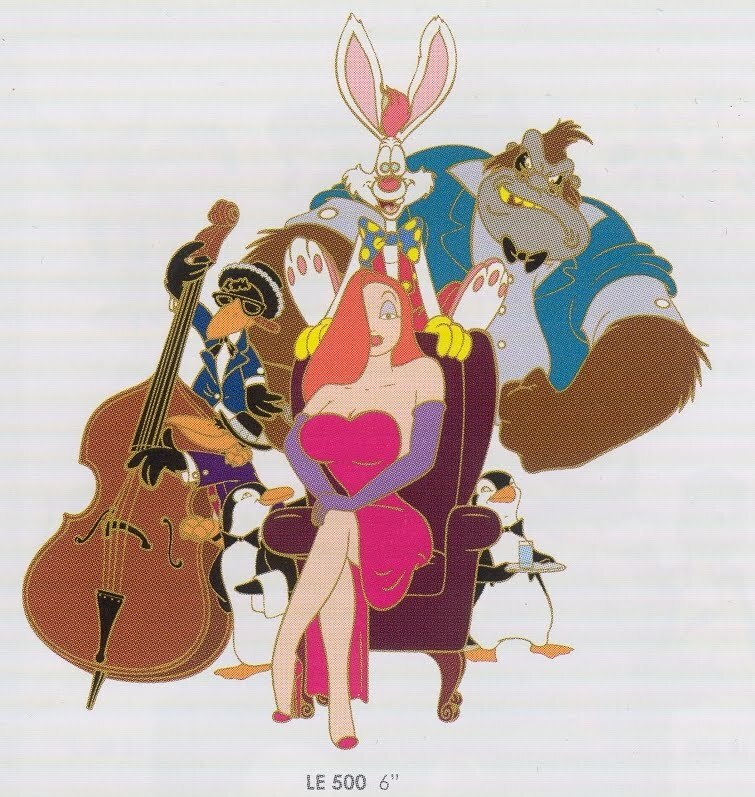 Pin 3 is Roger and Bongo's shoulder, pin 4 is Jessica's torso and back of the chair and Roger's hands , pin 5 is Jessica's bust, the bottom of the chair and the penguin waiters. The 6th pin is Bongo the Gorilla. Although listed as a puzzle pin, when you take it out of the box, all the layers are bolted together and cannot be removed - therefore making it a moot point to call this a puzzle pin. The Jessica & Roger Rabbit Super Jumbo Puzzle Pin gets a 3½. There is no denying this is a great pin, especially adding Bongo, the crows and penguin waiters. Jessica's eye is a little strange - but it loses points for being called a puzzle pin even though you can't take it apart.